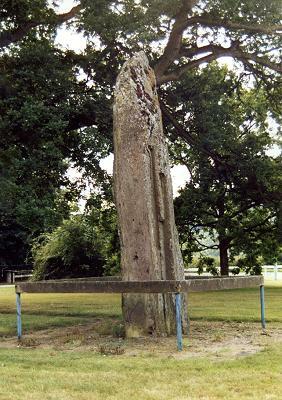 This fractured red sandstone monolith is around 4 metres tall and about 70cm by 120cm in width and is shorter than, but similar in shape to, the stones of the Devil's Arrows in Yorkshire. Also known as Cwrt y Gollen Monolith it must be the largest stone in an area rich in similar standing stones and is probably the most easy to find and visit, although the land it stands on was once an Army Cadet camp and controlled by the Ministry Of Defense, it would now seem that the military have abandoned the base. 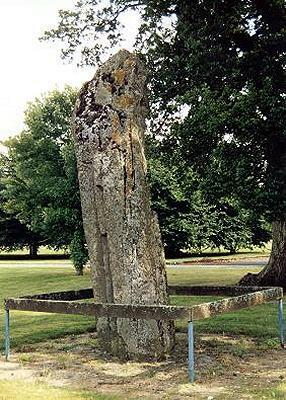 The site is next to the A40 road from Abergavenny to Crickhowell and is close to Gwernvale Dolmen. The road itself follows the the valley bottom of the River Usk with the hills of the Black Mountains to the north and the eastern edge of the Brecon Beacons to the south and must always have been an important route through the hills which probably accounts for this stone's position here - was it some kind of Neolithic or Bronze Age way marker? Later during the Roman period this route was formalized as the Roman road of Via Julia.